From the Chancel Steps, look into the body of the church. The line of the steeply pitched roof of the original 14th century chapel can be seen on the tower wall. The oak panelled roof is a reproduction of an earlier one. 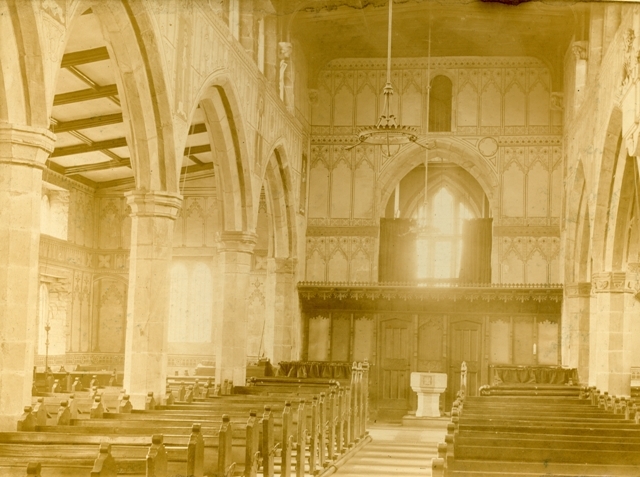 The date above the Chancel Steps shows this roof to have been built in 1884, replacing the 1510 original. Note the newer carved corbels supporting the existing beams, and the original corbels, now redundant. The most significant work in recent years has been the restoration of the church roof, the lead stolen and the later felt roof-covering having passed its useful life. An extensive recovering of the roof with stainless steel panels and also some stonework repairs were completed in the latter part of 1992 after an extensive 'Giving' and fundraising effort under the banner "Raise the Roof". The Giving by parishioners was generous and, with a grant from English Heritage, it has enabled the £125,000 cost to be met without borrowing.